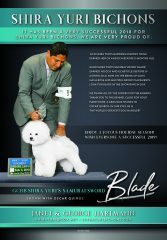 Blade is currently ranked #8 Bichon. He is ranked #3 Bichon for Grand Champion points earned in 2018. He is on the brink to go GCHS in 2018. George and I are very proud of our boy. Many thanks to Oscar for all of his hard work showing him to the max. Blade will be 25 months old the end of November. We are looking forward to a successful 2019. Wish all of you a grand holiday season!